Please note: The FlapLock FL01 pricing is now different from the figure used in the video. Visit the product page for accurate pricing. The FlapLock™ is a lockable internal letterflap that is fitted to the internal side of front doors helping to reduce the risk of arson, fishing of items via the letterflap and bumping of locks to gain access to the property. The item features adjustable catches that allow for users to set the FlapLock™ to either locked (typically through the night) or unlocked (when expecting mail – e.g. in the morning). The FlapLock™ is fitted to the rear of the door with the use of a pair of industrial strength adhesive pads that firmly fix the item to door. Additional security fixings are also supplied with the product to increase the resistance of the item further. Please note: Both versions of the FlapLock™ will not prevent arson where an accelerant is used. Developed in conjunction with the Cleveland Arson Task Force team, the FlapLock™ is used by both commercial and domestic clients. The item is popular with Fire & Rescue, Police forces and Housing Associations, as well as domestic home owners looking to secure their property. Throughout many organisations, the FlapLock™ is widely used with both security and fire reviews undertaken – helping to improve the security of properties. Despite the popularity of the FlapLock™ and wide use throughout the UK, we still read of cases in the news whereby the FlapLock™ could have made a difference and potentially prevented those incidents occurring that are particularly common throughout the winter months. 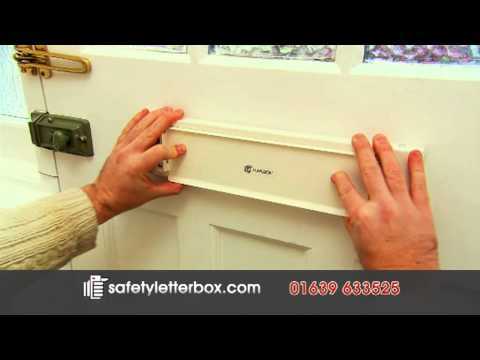 The Safety Letterbox Company provide free of charge samples of the FlapLock™ FL01 letterbox security lock to commercial customers such as Fire & Rescue Services, Police Forces and Councils. The FlapLock™ FL01 letterbox security lock is a best-selling solution that is simple to fit, inconspicuous and extremely good value for money product that provides peace of mind to the user when locked. The FlapLock™ FL01 is designed to help prevent a variety of door letterbox issues such as arson, mail theft and burglary; a common occurrence across the UK on a daily basis. The FL01 variation of the product is simple to attach to the property door with the use of a pair of industrial strength adhesive pads that firmly fix the FlapLock™ to the door and comes complete with additional security fixings. The FlapLock™ FL05 letterbox lock is a long-term solution to the common issues surrounding the classic letterbox in a property door.The FlapLock™ FL05 is supplied with a set of four coach bolts that securely fasten the product to the property door, eliminating the chance of leverage being used to remove the product from the door. The FL05 is popular with commercial clients who have a requirement for a long term solution for properties that may be vacant for a period of time, but have the potential for the letterbox to be used again at some point in the future. The heavy-duty FlapLock™ is a versatile product and helps to protect homes across Britain. Can this be used as a letterbox blanking plate? What is a letterbox blanking plate? A letterbox blanking plate is designed to block off access to your home via a letter aperture in the external property door, helping to prevent security issues such as arson attacks, vandalism, anti social behaviour and theft. Letterboxes are one of the most vulnerable points of your home, by removing this issue by using a letterbox blanking plate, you increase the security of your home. Why would I use the FlapLock™ as a letterbox blanking plate? Yes. The FlapLock™ can be used as a letterbox blanking plate by engaging the security catches which blank off the door, but the catches can be left opened if you are expecting a mail delivery.